I've been going through the "classic" FC&G posts with the idea of releasing some of the best in book form, and I realize that many of our current readers may have joined us mid-conversation and not had time to read all the back posts they might like. Therefore, I'm going to occasionally release a "best of" post that updates an older column. Today, we have what I call "ersatz cotton ball," or make-up removers. I was very proud of this project back in January 2010 when I came up with the idea. I'm even prouder of it now, at the end of 2014. Many of the fleece make-up removers that I made over four years ago are still white and still in service. I've cut a few extra from time to time as I get a scrap of fleece that is suited for nothing else, and I've thrown a few away that were indelibly stained. But overall, most of my stash is still in service. Best of all, I've purchased about one bag of cotton balls a year for the past five years, instead of four or five per year without the wipes. You can see the original post for the original math; things have only gotten more expensive since then, so the savings is even greater. Have you tried this idea? Hi, my name is Jennifer, and I have a fleece addiction. Let me back up a bit. In previous posts, I talked about finding sustainable replacements for the kind of disposable items that are so annoying to pay for. For me, one of these is cotton balls. I know, I know. They aren't that expensive. But cotton balls are one of those inherently disposable items that slowly leach money from your wallet while they add to the landfill. So, since I use cotton balls primarily as makeup removers, enter the ersatz cotton ball. This requires another slight digression: I love the remnant fabric bin at my local fabric store, and winter is the time that this bin is filled with fleece. After everyone spent Christmas making homemade Snuggies, that bin is full of mis-cuts, unwanted yardage, and the ends of bolts. So, if you aren't ultra-picky about the patterns you buy (and make no mistake, there are some cute ones and some wonderful solids in there), you can usually pick up fleece remnants ranging up to a yard and a half in length, all for 50 to 70 percent off. I have been raiding the remnant bin for months to find pieces with which to make fleece socks, so I happened to have some white fleece ends left over, but any color would do. 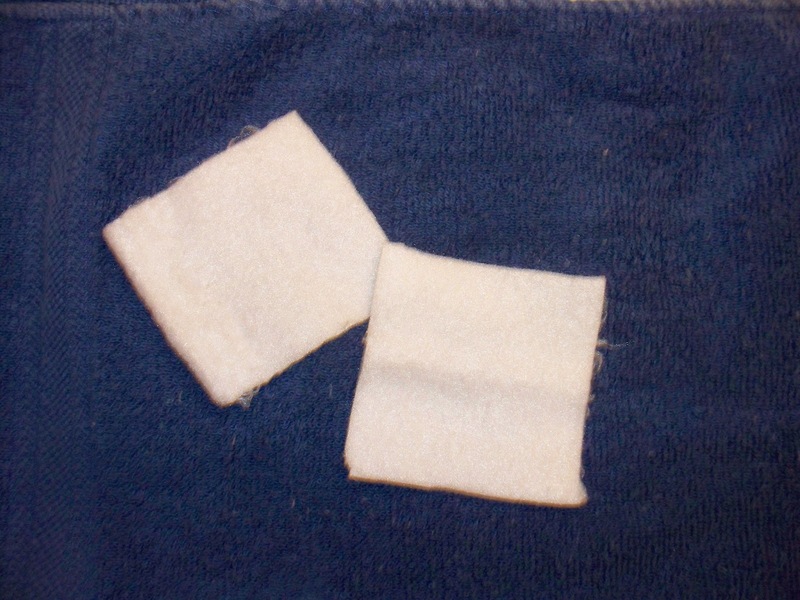 Simply cut your fleece remnant into 2"x2" squares, and there you have it -- make up remover pads, otherwise known as ersatz cotton balls. Fleece doesn't fray, so you don't have to worry about hemming, which makes this a fine no-sew project. I hang a mesh laundry bag on the back of the bathroom door, and when I have a reasonable bag full of dirties, I toss them in the white load. I don't up the amount of detergent I use, and the weight of these is so negligible that I don't think my machine is adding more than a few cents extra water. In the summer, I'll be hanging that mesh bag out on the clothes line to dry, so they will dry for free. Best of all, I can use these again and again. Fast: I think it took me 10 minutes to make a jar full of ersatz cotton balls, enough to last me a while. On a busy grocery day, it could take me that long to slog my way down the make-up aisle to get cotton balls. Cheap: I raided my own fleece stash and used pieces too small for anything else, but assuming you buy light-colored fleece for this project, you should be able to make all you need for about a quarter of a yard. If you get your yardage from the remnant bin, you should not be spending more than 50 to 75 cents. The closest analog to these is disposable make-up remover pads, which Rite-Aid has for $1.69 for 80; jumbo cotton balls should come in for about the same price for 100. Assuming four to five purchases of each over the course of a year, you will spend $8.45 on your makeup remover pads if you buy the disposable, compared to about 75 cents for the reusable kind. That leave $7.70 of pure savings, plus the warm fuzzy of knowing you didn't contribute these bits to the landfill. I love your idea! How well do these work as nail polish removers? I don't regularly use them as nail polish removers, so I'm not sure. The ones I've grabbed for that in an emergency have been some of the ones I've tossed. The nail polish will have a more difficult time washing out of the fleece than makeup does, so you might need a set that you are willing to see get stained more quickly and just be willing to throw them away more regularly. But it's still, then, a good way to use up a fleece scrap. Should You Grow Tomatoes in Grow Boxes?